Every fellowship dollar is seed money that goes directly to the scientist NOT to their institution, and NOT for our overhead. And every fellowship is dedicated to specific scientific research by specific researchers. Your contribution – whether a donation in honor of a family member or friend, or your funding of a 2-year cancer research fellowship for $11,000 annually – will go far toward finding a cure. ICA USA is a non-profit, charitable organization. Donations are 100% tax deductible as long as no goods or services have been provided in exchange for the donation, and all our donors will receive a tax letter for their files. Click here to make a secure payment online. To make a payment by phone, call 1 (561) 832-9277. Please note, we are unable to accept Bank Withdrawal /Check payments online. To make a contribution by check, please call the above number for instructions. 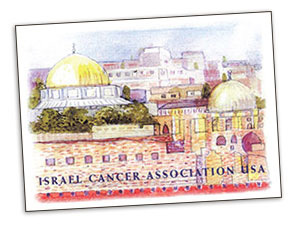 An ICA USA Tribute card lets family and friends know you are thinking of them. Commemorate any occasion by making a donation to ICA USA in honor of a new baby, a Bar or Bat Mitzvah, a wedding, a graduation or anniversary. Our tribute card can be sent to honor the memory of a loved one or friend, or to wish a speedy recovery. Let us help you honor the important people in your life. Rosh Hashanah and Holiday Tribute cards are also available.